Dragnet was a police detective drama series that aired on NBC and showed every detail of the procedures involved in the investigation of a crime, analyzing the clues, and apprehending the perpetrator. For the first time, audiences saw what detective work was really like including everything from capturing dangerous criminals to filling out the paperwork. George Fenneman (Groucho Marx's sidekick on "You Bet Your Life (1950)") read the opening narrative (see below) on this series and the radio version of Dragnet. Hal Gibney read it for the 1967-1970 series. Dragnet premiered two years after the 1949 premiere of a Dragnet radio show. That radio series ran until 1957 so both versions of Dragnet aired concurrently from 1951 to 1957! 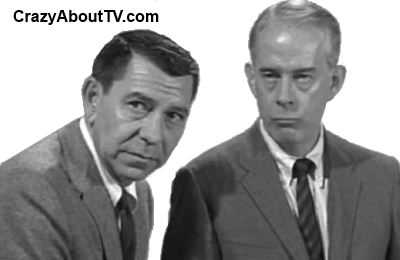 Jack Webb also played Joe Friday on the radio series but his "sidekick" was played by Barton Yarborough who also appeared on this TV series but not as Friday's partner. Eight years after this version of Dragnet ended, it returned in 1967 for another three season run, ending in 1970. Only Jack Webb and Harry Morgan returned from the original cast. In 1989, Dragnet returned to television once again. While the storylines remained pretty true to the Dragnet format, the entire cast was, of course, different with Jeff Osterhage and Bernard White playing the two plainclothed police detectives. By 1989, however, there were new police series with more excitement like the "Cops TV Show" or "America's Most Wanted" for viewers who wanted to see police officers in action. The first episode of Dragnet, "The Human Bomb", actually appeared as a preview on a series titled, "Chesterfield Sound Off Time". Thank you for visiting our Dragnet page!